A sweetener used in food manufacture could be partly to blame for rising rates of type 2 diabetes, say scientists. 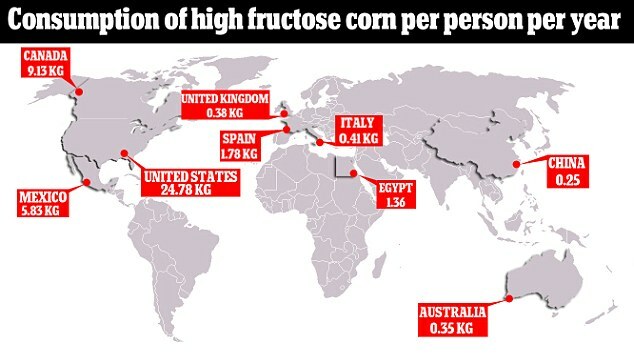 Countries that use large amounts of high fructose corn syrup (HFCS) have higher rates of the disease than those that consume little, says a new study. Among 42 countries studied, rates of diabetes were 8 per cent in high-consuming nations and 6.7 among low consumers – a difference of 20 per cent. In the UK, foods containing fructose syrup include McVitie’s HobNobs, McVitie’s Jaffa Cakes, Carte D’Or ice cream and Mr Kipling Bakewell Slices. It often appears in ingredients lists as ‘glucose-fructose syrup’, ‘high fructose corn syrup’ or ‘HFCS’. HFCS has a greater proportion of fructose sugar than sucrose, which contains an equal amount of glucose. The syrup is widely used in drinks and processed foods such as biscuits and ice cream because it acts as a sweetener and improves appearance, providing a consistent browning after oven heating. Of the countries studied, the US had far and away the greatest consumption per head of HFCS, amounting to 55lb per year per year, says a report in the journal Global Public Health. Hungary, Canada, Slovakia, Bulgaria, Belgium, Argentina, Korea, Japan and Mexico were also high consumers. 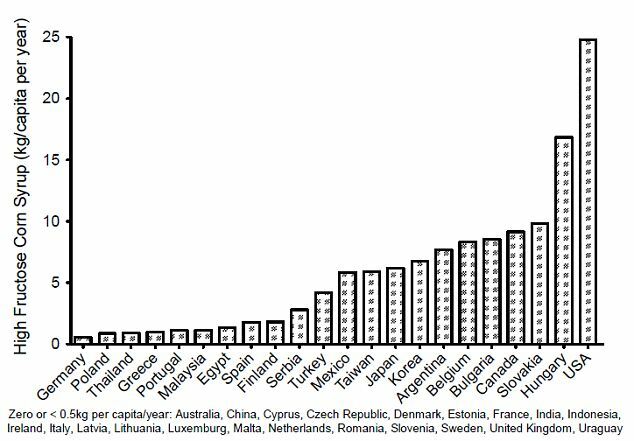 UK consumption was very low at less than 1lb per person per year, placing it alongside Australia, China, Denmark, France, India, Ireland, Italy, Sweden and Uruguay. But Professor Ulijaszek said the UK was a high consumer of total sugar at some 88lb per person per year. Sugar consumption, irrespective of the type, was strongly linked to diabetes, he added. He said: ‘Although this syrup can be found in many of our processed foods and drinks, this varies enormously from country to country.’ He said there was relatively little fructose consumed in the UK, with Hobnob biscuits being an exception. ‘But eating fructose at low levels is OK’ he added. ‘You would have to eat very many biscuits to get high fructose levels into your system.’ He said the UK had relatively high diabetes rates and was a high consumer of total sugar at almost 40kilos per person per year. Sugar consumption, irrespective of the type, was strongly linked to diabetes, he said. British people love their sugar which goes back to colonial times and there is also a very strong sugar industry here. Consumers should have better labelling with regards to sugar consumption, and public health strategies aimed at diabetes prevention should incorporate efforts to limit sugar consumption’ he added. Tim Lobstein, director of policy for the UK-based International Association for the Study of Obesity, said ‘If HFCS is a risk factor for diabetes-one of the world’s most serious chronic diseases-then we need to rewrite national dietary guidelines and review agriculture trade polices. A spokesman for the British Soft Drinks Association said ‘You can’t draw any conclusions from this research because it does not actually look at the relationship between consumption of HFCS and diabetes. ‘Those studies that have looked at this relationship find that there isn’t one. ‘The risk factors for type 2 diabetes have been assessed by the International Diabetes Federation as being overweight/obesity, aging, ethnicity, family history of diabetes, previous gestational diabetes and a sedentary lifestyle.